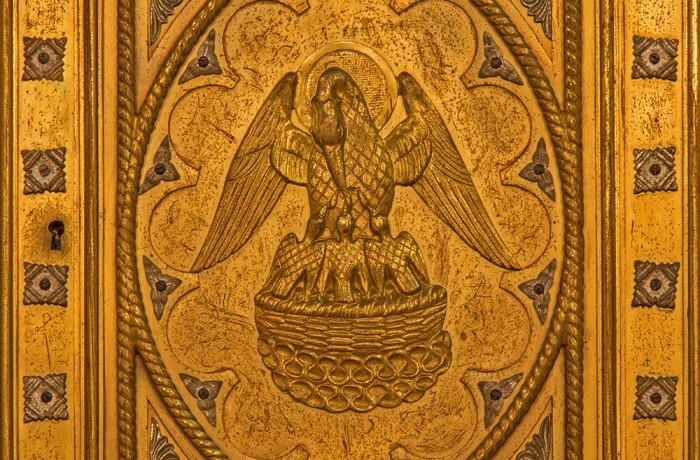 The pelican, a symbol of Christ and the Eucharist, is readily recognisable. Until quite recently, the people of Ireland used to go to Pelican House in Dublin, to give their blood for the benefit of those whose lives were in danger or who were otherwise in need of blood transfusions. Also, in many churches, one can see beautiful carvings and mosaics of pelicans, along with the wheat and the grapes. Legend describes the pelican as a symbol of charity. She is a very maternal bird that pecks at her breast with her beak until her blood flows, which she then feeds to her hungry babies. Other legends say that when the young get older they rebel against the father pelican and in his anger he kills them. The mother, full of sorrow for her dead young ones, mourns for three days and then pours her blood over them and they revive to be fed again on her blood. The resurrected young pelicans are full of renewed goodness. The image is reminiscent of the love and charity of Christ for humanity. Though we were dead in sin, He shed His blood for us and we came back to life in Him. Through the Eucharist, His Body and Blood, He continues to nourish us and thereby restoring us to health and goodness.